Pointer is a variable that points to a memory location. 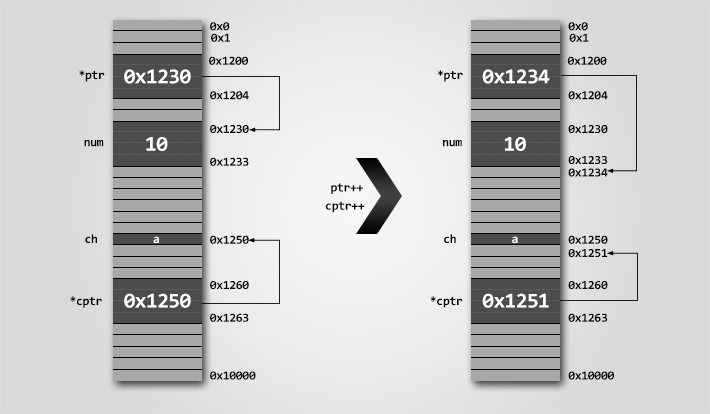 Memory addresses are numeric value that ranges from zero to maximum memory size in bytes. These addresses can be manipulated like simple variables. You can increment, decrement, calculate or compare these addresses manually. Increment operator when used with a pointer variable returns next address pointed by the pointer. The next address returned is the sum of current pointed address and size of pointer data type. Read more about, how to find size of a data type. Or in simple terms, incrementing a pointer will cause the pointer to point to a memory location skipping N bytes from current pointed memory location. Where N is size of pointer data type. Similarly, decrement operator returns the previous address pointed by the pointer. The returned address is the difference of current pointed address and size of pointer data type. For example, consider the below statements. Note: Increment operation increments pointer address by the size of pointer data type. If an integer pointer ptr pointing at 0x1230, after ptr++ it will point at 0x1234 (assuming integer size is 4 bytes). If a character pointer cptr pointing at 0x1250, after cptr++ it will point at 0x1251 (since character occupies 1 byte). Array in memory are stored sequentially, hence is the best example to demonstrate pointer increment, decrement operations. Pointer increment operation increments pointer by one. Causing it to point to a memory location skipping N bytes (where N is size of pointer data type). We know that increment operation is equivalent to addition by one. Suppose an integer pointer int * ptr. Now, ptr++ is equivalent to ptr = ptr + 1. Similarly, you can add or subtract any integer value to a pointer. Adding K to a pointer causes it to point to a memory location skipping K * N bytes. Where K is a constant integer and N is size of pointer data type. Let us revise the above program to print array using pointer. When count = 0, (ptr + count) is equivalent to (ptr + 0) which points to arr and hence prints 10. When count = 1, (ptr + count) is equivalent to (ptr + 1) which points to arr and hence prints 20. Similarly when count = 4, (ptr + count) is equivalent to (ptr + 4) which points to arr and hence prints 50. Output of above program is same as first program. In C, you can compare two pointers using relational operator. You can perform six different type of pointer comparison <, >, <=, >=, == and !=. Note: Pointer comparison compares two pointer addresses to which they point to, instead of comparing their values. Pointer comparisons are less used when compared to pointer arithmetic. However, I frequently use pointer comparison when dealing with arrays. Let us re-write our array program without using count variable. Pointer arithmetic can be a nightmare if not used correctly. Incorrect pointer arithmetic will lead to you compilation error as well as program crash. Following are some rules that you must mind while performing pointer arithmetic. You must not use multiplication and division operator with pointers. ptr3 = ptr2 – ptr1;               // Invalid, non-portable pointer conversion. // Missing cast. See rule 1.
ptr3 = ptr2 – ptr1 - k;	          // Invalid, non-portable pointer conversion. ptr3 = ptr1 + ptr2;               // Invalid, non-portable pointer conversion. ptr3 = ptr1 + ptr2 + k;	          // Invalid, non-portable pointer conversion. ptr1 = ptr1 * 2;                  // Invalid, illegal use of pointer. See rule 3.
ptr1 = ptr1 * k;                  // Invalid, illegal use of pointer. See rule 3.
ptr3 = ptr2 * ptr1;               // Invalid, illegal use of pointer. See rule 3.
ptr1 = ptr1 / 2;                  // Invalid, illegal use of pointer. See rule 3.
ptr1 = ptr1 / k;                  // Invalid, illegal use of pointer. See rule 3.
ptr3 = ptr2 / ptr1;               // Invalid, illegal use of pointer. See rule 3.